- The Advent is considered the best in its class for durability and stability. 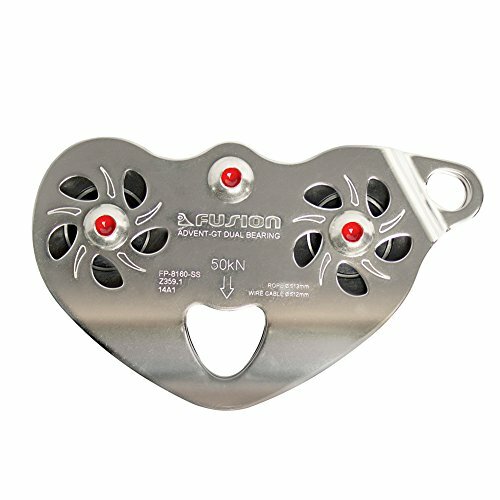 - Stainless Steel 304 heat treated body, designed for extreme and continuous service in permanently rigged challenge courses, commercial ziplines and eco-tourism applications. - This pulley has 2 points of attachment both primary and back-up. - Great for commercial operators by giving them the ability to replace bearings for extended use. - This product is strong and reliable with sealed ball bearings & long wear alloy sheaves making it the ideal tandem pulley. Sealed ball bearings, long wear alloy sheaves, 2 attachment points (primary and back-up). Dimensions: 4.19" x 4.51" x 1.38"